This article is about water wells. For other uses, see Well (disambiguation). "Village pump" redirects here. 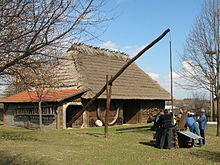 For the set of pages used to discuss the technical issues, policies, and operations of Wikipedia, see Wikipedia:Village pump. 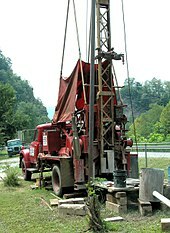 A well is an excavation or structure created in the ground by digging, driving, or drilling to access liquid resources, usually water. The oldest and most common kind of well is a water well, to access groundwater in underground aquifers. 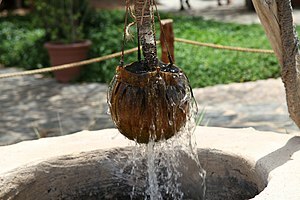 The well water is drawn by a pump, or using containers, such as buckets, that are raised mechanically or by hand. Wells were first constructed at least eight thousand years ago and historically vary in construction from a simple scoop in the sediment of a dry watercourse to the qanats of Iran, and the stepwells and sakiehs of India. Placing a lining in the well shaft helps create stability, and linings of wood or wickerwork date back at least as far as the Iron Age. Wells for other purposes came along much later, historically. The first recorded salt well was dug in the Sichuan province of China around 2,250 years ago. This was the first time that ancient water well technology was applied successfully for the exploitation of salt, and marked the beginning of Sichuan’s salt drilling industry. 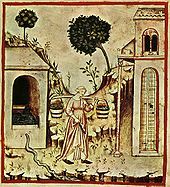 The earliest known oil wells were also drilled in China, in 347 CE. These wells had depths of up to about 240 metres (790 ft) and were drilled using bits attached to bamboo poles. The oil was burned to evaporate brine and produce salt. By the 10th century, extensive bamboo pipelines connected oil wells with salt springs. The ancient records of China and Japan are said to contain many allusions to the use of natural gas for lighting and heating. Petroleum was known as Burning water in Japan in the 7th century. Lately,[when?] 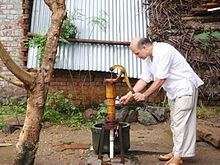 however, the described wells/pumps are no longer very efficient and can be replaced by either handpumps or treadle pumps. Another alternative is the use of self-dug wells, electrical deep-well pumps (for higher depths). Appropriate technology organizations as Practical Action are now[when?] supplying information on how to build/set-up (DIY) handpumps and treadle pumps in practice. ^ Kuhn, Oliver (2004-06-30). "Ancient Chinese Drilling". Canadian Society of Exploration Geophysicists. Canadian Society of Exploration Geophysicists. 29 (6). ^ Chang, Mingteh (2012). Forest Hydrology: An Introduction to Water and Forests (3rd ed.). CRC Press (published November 1, 2012). p. 31. ISBN 978-1439879948. ^ Koon, Wee Kek (July 25, 2015). "How the ancient Chinese looked after their drinking water". South China Morning Post. ^ "Sakieh explication/difference vs Sakia". Britannica.com. Retrieved 2011-12-19. ^ "Sakia explication". Britannica.com. Retrieved 2011-12-19. ^ "Stone Age wells found in Cyprus". BBC News. ^ Ashkenazi, Eli (November 9, 2012). 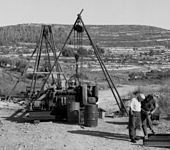 "Ancient Well Reveals Secrets of First Jezreel Valley Farmers". Haaretz. ^ "ASTM International - Standards Worldwide". www.astm.org. ^ Joseph P. Riva Jr. and Gordon I. Atwater. "petroleum". Encyclopædia Britannica. Retrieved 2008-06-30. ^ "Woodingdean Well". 2005. Retrieved 26 Jan 2010. ^ "St. Patrick's Well". Umbriatravel.com. Retrieved 2011-12-19. ^ "How I drill a Well." Popular Science, April 1952, pp. 177-181. ^ Association), NKBA (National Kitchen and Bath (2013-10-29). Kitchen & Bath Residential Construction and Systems. John Wiley & Sons. ISBN 9781118711040. ^ Du Preez, Michael. "ELECTRO-SEISMIC SURVEYS APPLIED TO MODDELING OF GROUNDWATER FLOW SYSTEMS" (PDF). Bloemfontein, South Africa. Retrieved 21 April 2011. ^ a b c d e Committee on Environmental Health; Committee on Infectious Diseases (2009). "Drinking water from private wells and risks to children". Pediatrics. 123 (6): 1599–1605. doi:10.1542/peds.2009-0751. PMID 19482772. ^ Association, American Water Works (2003). Water Sources. American Water Works Association. ISBN 9781583212295. ^ Meulemans, C. C. E. (1987-09-01). "The Basic Principles of UV–Disinfection of Water". Ozone: Science & Engineering. 9 (4): 299–313. doi:10.1080/01919518708552146. ISSN 0191-9512. ^ "Soil salination by placement of water wells mentioned in India". Ngm.nationalgeographic.com. 2002-10-17. Retrieved 2011-12-19. ^ "Practical Answers – Handpumps". Practicalaction.org. Retrieved 2011-12-19. ^ "Treadle pump". Dev.practicalaction.org. Retrieved 2011-12-19.